Lutron drapery track systems electronically operate pinch pleat or ripplefold draperies to elegantly provide quiet, convenient control of daylight. Simple controls and smooth transitions transform any room into a pleasing, inviting space. 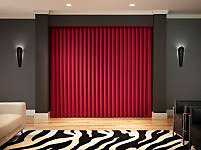 An industry first, the Kirbé vertical drapery system smoothly pulls fabric up and completely out of the way - unlike traditional draperies that move from side-to-side. This unique design provides greater access to windows and views by eliminating the creation of stack back.